Island Conservation Director of Communications Heath Packard explains why the project to restore Lehua Island, Hawai’i is a promising opportunity for seabird and biodiversity conservation. Lehua Island represents an important conservation opportunity, being one of the largest and most diverse seabird colonies in the main Hawaiian Islands. It has historically provided or provides habitat for 17 seabird species, including the Endangered Species Act (ESA) Threatened Newell’s Townsend’s Shearwater (Puffinus newelli) previously known to nest on the island, the ESA Endangered Band-rumped Storm-petrel (Oceanodroma castro) and the IUCN Near Threatened Black-footed Albatross (Phoebastria nigripes), which breeds on the island. In addition to hosting a diversity of seabird species, Lehua Island is home to 9 endemic species as well as an additional 13 native plant species. Lehua is an important part of native Hawaiian culture; the Ni’ihau community accesses the island for ‘Opihi Shellfish gathering. Lehua also has a number of archaeological sites. Introduced, damaging (invasive) species–specifically rodents–pose a significant risk to native Hawaiian birds and wildlife. On Lehua Island invasive rats are having an ecosystem-wide impact; they constitute a leading threat to the island’s vulnerable seabird species. Threatened Newell’s Shearwaters are likely being restricted from breeding on Lehua Island due to predation by rats. Fortunately, there is yet hope for Lehua. Island Conservation is proud to be partnering with the local community and their government (Department of Land and Natural Resources) on a proposed eradication project to make Lehua safe for threatened birds. I am honored to be part of the team, working on Kaua’i this week helping to ensure effective communications, transparency, and community relations. Read on to learn more about our work on Lehua. TGI: What is Island Conservation and how did the organization get involved with Lehua Island? We began in 1994 in California and we do science-based conservation. 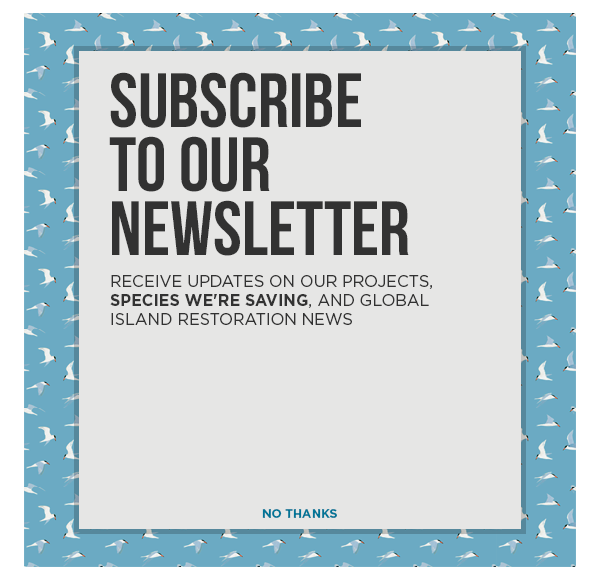 We’re the world’s only global, non-government, nonprofit organization whose sole mission is to prevent extinctions by removing invasive species from islands. So, in our 23 years we’ve done treatments on 66 islands. About 60 of those are completed and confirmed. Five or six of them are still pending confirmation because it takes a year or two to before you can confirm the presence or absence of rats. It has to do with the reproductive cycle. If you leave one pregnant female, the island will be re-infested in a couple of years and you have to have more than one rat for detection, so you don’t know the results for a couple of years. TGI: What is the success rate for these island rat eradication projects? There’s a large field of conservation biologists and ecologists and land managers that do this kind of work. There have been some 600 operations, and we’ve done 66. Of those 600 operations, somewhere on the order of 90 percent have been successful the first time. There’s always a risk of not getting every single last rat and there’s occasionally risks of new introductions. For us, in our entire history we’ve only had two unsuccessful projects. One was Desecheo National Wildlife Refuge in Puerto Rico and the other was Wake Atoll. I’m pleased to say we just redid Desecheo and it was confirmed successful a couple months ago. On Desecheo National Wildlife Refuge, we learned seasonality was an important factor — making sure you come in when the population is at its lowest and the alternative food sources are lowest. So we schedule during the dry season when we’re in the tropics. Also, we extended the timeline between bait drops because if they’re too close together you won’t get every last rat — some could still have not fledged from the nest and gone foraging. On Wake Island, there’s a bunch of built environments: Buildings, barracks, residences and those kinds of things. We were dealing with two kinds of rats and we were successful with one. The other persists. You need the residents to fully buy in and follow protocols to be successful — a few little mistakes are all you need for one pregnant female to survive. TGI: What is your experience with the rodenticide diphacinone and marine environments? The bait pellets are specifically designed to break down over a period of time in the environment. The moisture in the atmosphere on Lehua will break down the pellets into dust and particles into the substrate. If it hits the water it breaks down in minutes or hours and it’ll precipitate out into the ocean floor and when it’s at the bottom, it’ll begin to degrade in a matter of weeks into hydrogen and carbon. There’s a limited time in which the bait is available for anything that might eat it in the water column. We did some lab studies with bait and triggerfish — which are prominent out there. Scientific protocols were followed and we found no evidence of the triggerfish consuming or ingesting the toxicant. TGI: How does the bait drop work? The conditions have to be ideal — we need the right weather and the right wind conditions. There’s a go-no-go decision the day of the drop before daylight because they have to look at best available forecast and sea conditions. It’s aerial application by helicopter — so, there is a bait bucket that hangs down underneath the helicopter on a tether. It’s a modified agricultural hopper, like what’s used in farming. We’ll use technology called Track Mapping, plus GIS and GPS so the pilot can see exactly where he or she has been and can lay a swath of toxicant that’s barely overlapped by the next one and theoretically get every square inch. When they do the runs around the water perimeter, they’ll put a deflector on the rotor so it’s directionally shooting toward the land. It’s technical and precise and there are years of planning and design that goes into these operations. TGI: Why choose the poison diphacinone over the alternative poison brodifacoum, listed in the Environmental Assessment? Diphacinone has been used less frequently and has a lower efficacy rate. Of the 600 projects that have been done, the vast majority have been done with brodifacoum because it’s the most effective, but it also has a higher degree of risk. Diphacinone was chosen by the partnership in response to the conservation culture here (on Kaua’i). They want a tool that works most of the time, but carries a little less risk. We’ve worked with bait manufacturers and the partnership to redesign the bait to make it as palatable as possible for the rodents and they’ll do three distributions and hopefully get every rat. We’re optimistic that the plan has been designed right and if it succeeds it could be a signal for innovation for using that lower risk toxicant elsewhere and more often. TGI: How important is community input and communication? We only do this work in partnership. That’s the only way you can do it. You have to work with the local land managers, the permitting agencies, the local communities, and the stakeholders. I know there is an active debate in how well that was done in this case, but I’m here to facilitate those answers and talk with the community and county leaders about the project.